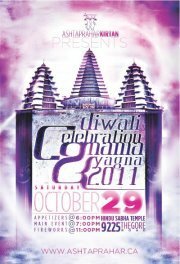 Ashtaprahar Diwali Celebrations - Saturday, October 29, 2011 @ Hindu Sabha Mandir ~ The Toronto Hare Krishna Temple! In conjunction with Toronto's Hare Krishna Temple, the Ashtaprahar Organizing Team is presenting special Diwali Celebrations at the Hindu Sabha Mandir in Brampton, Ontario on the evening of Saturday, October 29h, 2011. Festivities during the weekend will also include afternoon celebrations marking Srila Prabhupada's Disappearance and Sunday evening festivities (at the Hare Krishna Temple). Saturday evening festivities at the Hindu Sabha Mandir will include a great line-up of kirtaneers, delicious prasadam and much more! A special call goes out to our Hare Krishna community of devotees to check out this event which will be part of a full weekend of activities! oops! fixed now! thank you!